People look with their eyes, but see with their brain. The most natural and comfortable feeling of having a crystal clear vision at every split second belongs to those who are in their adolescence years of age. However, this ability tends to start fading away right after you reach the age of 30. The effectiveness of your brain functionality starts to decline. Therefore, you feel tired and fatigued easily especially when you have to stare at the computer screen for hours, or read work documents and papers all day long. In the future, I will open a centre for improving the quality of vision in order to maintain the quality of vision from an infant till the day where he/she closed his/her eyelids. I believe that if we can help someone achieve the best vision quality, we would be able to make his/her brain work more efficiently. From their faith in God and faith in the value of vision leads to inspirations to study further development in order to produce the best spectacles in the world which results in, the creation of new standards of optometric, designing and assembling high - end The ISOPTIK Ultra Individual Digital 3 D Progressive Eyeglasses that provide an instant crystal clear vision at all distances. 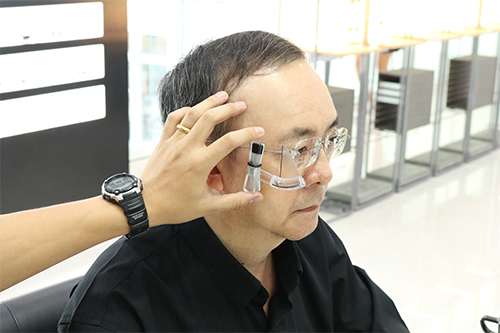 Everyday, the specialist team in the specific field of ophthalmologists and the doctor of optometry team from ISOPTIK corporate with the specialists in both inside and outside of Thailand have helped a countless of people by preventing visibility decay from eyes disease and other related disease achieved by running through the eye examinations and analysis in any tiny piece of detail. ISOPTIK puts in the ultimate care and quality services for every customer to obtain the highest visibility in all distances as much as possible for as long as the technology can be. 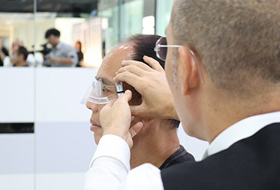 The expensive progressive lenses from old technologies can cost you around ten thousands baht. These lenses, if provided with the wrong structure, inaccurate eye examination and analysis, or even unmatched frames may cause the center of the lenses to differ from the direct angle of the centers of the wearer eyes can lead up to 95 percent decrease of the lenses effectiveness. 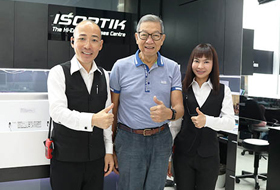 ISOPTIK The Hi-End Eyeglasses Centre is the first eye care centre setting new benchmark in vision care arena on eye examination, seamless Ultra Individual Digital 3 D Progressive lens design and eyeglasses assembly with the latest hi-end technology. Our team members of professional optometrist, doctor of optometry and optician work together to ensure that the customers not only receive the quality eyeglasses but also the excellent vision that the newest technology can achieve. Ultimately, we aim for retaining our customers’ best visual quality for the longest time as possible. Ultra Individual Digital 3 D Progressive Lenses are designed for the highest visual quality at all distances to amazingly increase your brain power. You will be able to think faster and focus better but feel less exhausted. Beyond that, you will bemore comfortable like being young again. More energy will remain for the other fun side of your lifestyle regardless of your age.